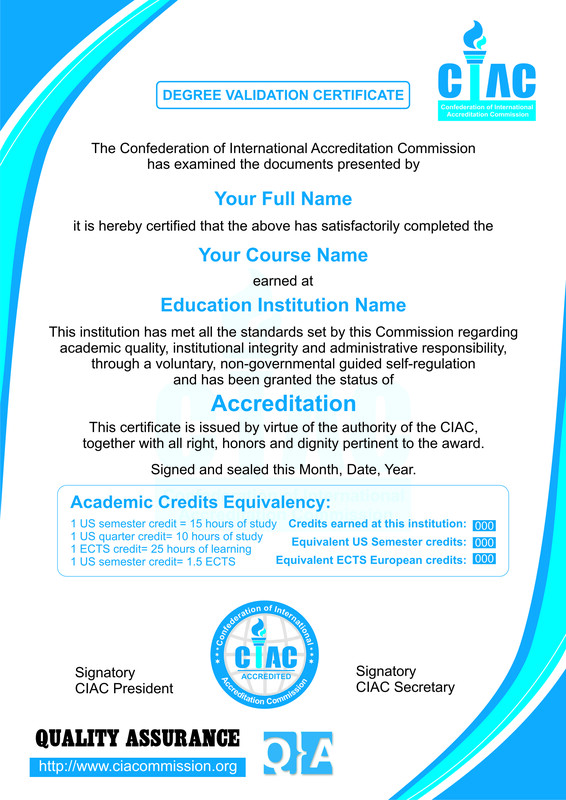 Graduates from the Confederation of International Accreditation Commission- CIAC accredited institutions or from institutions of education holding an equivalent accreditation (approved by the CIAC) may ensure and demonstrate that their education diploma, earned credits, and awarding institution are considered to be bona fide and accredited according to the Confederation of International Accreditation Commission- CIAC standards by requesting an CIAC Degree Validation Diploma. The CIAC Degree Validation Diploma also specifies the total credits earned and their equivalency in US Semester Credits and European ECTS credits. The fee for the Certificate is US$300.